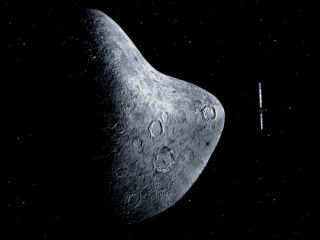 Illustration of asteroid with Rosetta approaching in the distance. A European spacecraftzoomed by a rocky asteroid Friday in the first of two pit stops on theway to a distant comet. TheEuropean Space Agency?s (ESA) Rosetta comet probe zippedby the asteroid Steins, a space rock in the asteroid belt between theplanets Mars and Jupiter, as it streaked across the solar system millions ofmiles from Earth. Rosetta madeits closest pass by Steins, officially known as Asteroid 2867, at 2:58 p.m. EDT(1858 GMT), and swung within 500 miles (800 km) as it flew past at a clip of19,262 mph (31,000 kph). The probe hashad Steins in itssights for weeks, and was expected to train its 11 instruments onto the spacerock and begin beaming the first images back to ESA?s mission control center inDarmstadt, Germany later tonight. Missionmanagers received their first post-flyby signal from Rosetta at about 4:14 p.m.EDT (2014 GMT). Images of the event showed mission controllers celebrating withwide smiles and hugs. ?The entireFlight Control Team just let out a loud cheer!? wrote Daniel Scuka, an ESAwriter chronicling Rosetta?s flyby on the ESA mission?s blog. Launched inMarch 2004, Rosetta and its lander Philae are headed for a planned 2014rendezvous with the comet 67/P Churyumov-Gerasimenko. Friday?s encounter with Steinsand a second flyby past the asteroid Lutetia in 2010 are expected to serve asdry runs for Rosetta?s comet encounter and shed new light on the compositionand orbits of similar space rocks. Aside fromsome minor challenges, the flyby appeared to go well. ?The status of the spacecraft is nominal,? said Andrea Accomazzo, spacecraftoperations manager for Rosetta, in an ESA interview before the probe made itsclosest approach. ?We had some issues in finding the proper setting of thecameras to do the tracking but now we?ve configured all the parameters and we?revery satisfied with the tracking that we?re receiving.? Astronomersbelieve Steins is a Class E-type asteroid, one of the rarest kinds of spacerocks in the solar system, and may hold in its rocky interior clues to howplanets and other objects formed billions of years ago, ESA officials have said.The asteroid may actually have been part of an even larger space rock thatchipped off in the distant past, they added. The spacerock is relatively small, about 3.1 miles (5 km) wide, and circles the sun froma distance of about 219 million miles (353 million km). Rosetta?sSteins flyby is the latest in a series of space rendezvous for the probe as itmakes its way out toward the comet 67/P Churyumov-Gerasimenko. Thespacecraft flewpast Earth twice, in March 2005 and November 2007, respectively, with athird pass by the planet due in November 2009. The spacecraft also flew pastthe planet Mars in February 2007 and is slated to rendezvous with the asteroidLutetia in June 2010 before heading off to its cometary quarry. Today?sasteroid flyby marked the first of two very different space milestones for ESAofficials. Whilescientists and engineers monitored Rosetta?s rendezvous from their controlcenter in Darmstadt, Germany, another team at a control center in Toulouse,France geared up for the planned 5:30 p.m. EDT (2130 GMT) undocking of the cargoship Jules Verne - Europe?s first Automated Transfer Vehicle? - from theInternational Space Station.